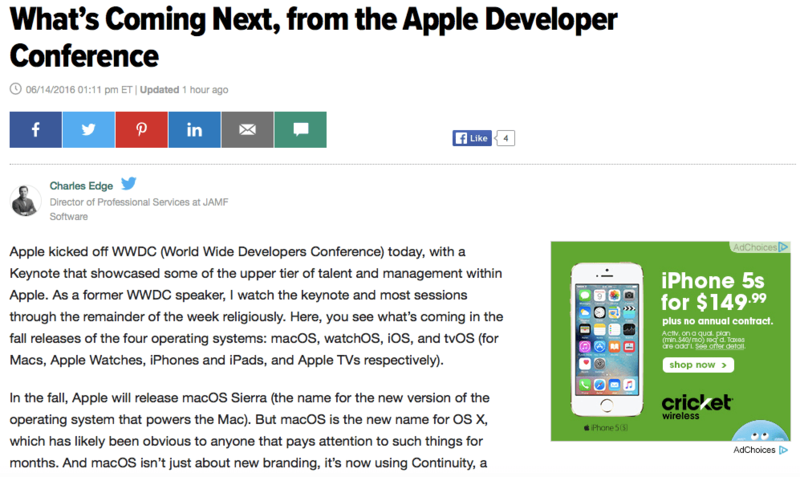 The first Apple Watch update appeared a few days ago. This update brings with it “improved performance” for Siri, different elements of activity tracking, accessibility and third party support. 1.0.1 also brings Brazilian Portugese, Danish, Dutch, Swedish, Russian, Thai and Turkish language support. And a few minor security issues were addressed. In short, you might want to run this one… To do so, first make sure your phone is close (less than 20 feet in my opinion) and that the watch has at least half a charge. To run the upgrade, start by opening the Apple Watch app on your iPhone. From the default screen (My Watch), tap on General and then tap on Software Update. From the Software Update screen, tap on Download and Install and let the watch do it’s thing (note, you’ll be prompted for a passcode if you have one configured). The update usually takes around 15 minutes. Don’t reboot or get the phone more than 20 feet from the watch during the update. Enjoy your Brazilian Portuguese! I keep looking for more and more ways to have my Apple Watch be really functional without having it talk to my phone when I need the function it’s performing. One of those can easily be looking at photos. One of these is to sync some photos to the watch so that if my battery dies or I leave my phone on my desk, I still have access to photos if I want to get to some. To sync pictures from your First, open the Apple Watch app on your iPhone. 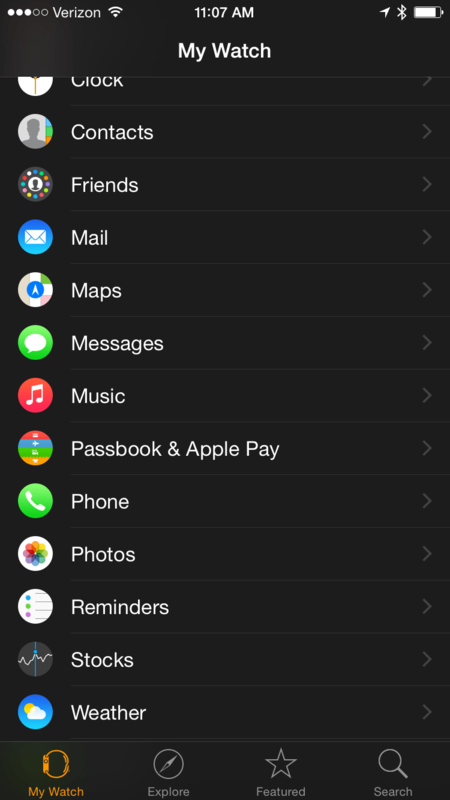 Then tap on Photos in the list of apps under the default My Watch tab. From the Photos screen, choose to be notified of alerts. I leave this set to Mirror My iPhone. 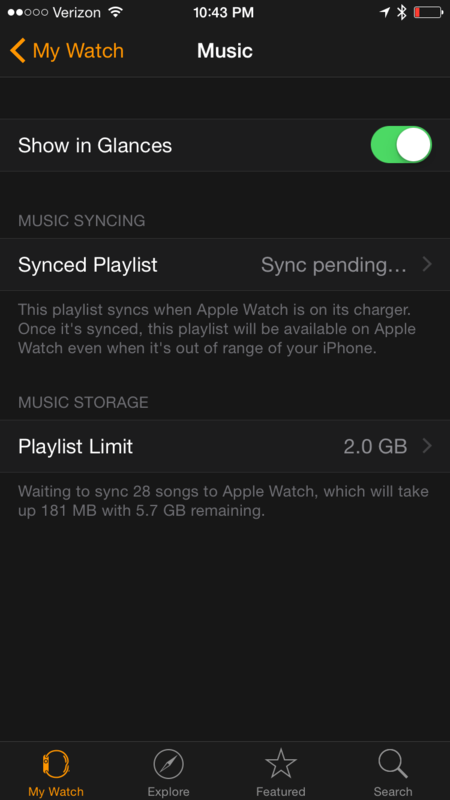 Then, set the Synced Album to any album on the phone that you’d like to sync to the watch. 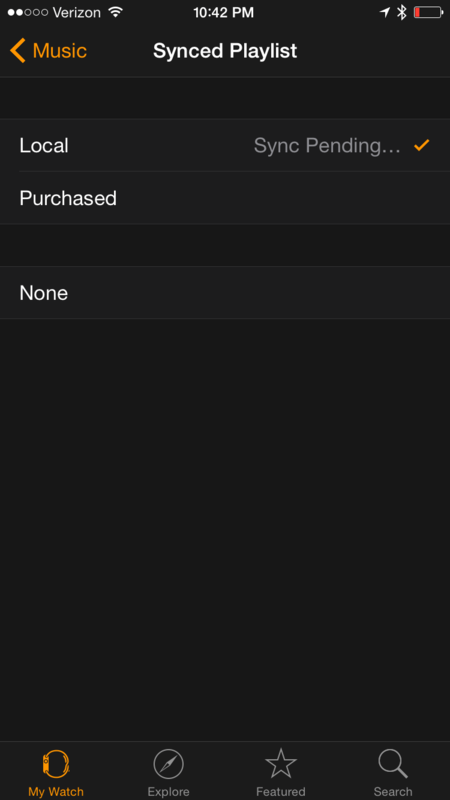 This might be Camera Roll, the default, or you can select any album that you’ve created. After I did this, I’ve created a new album call watch that syncs all the pictures I want on my watch. 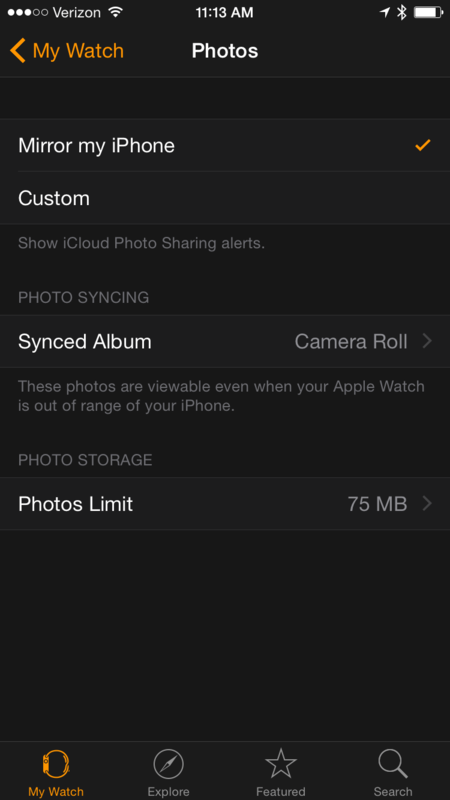 Tap on Photos Limit to configure how much space you allow the photo album to fill up on your watch. 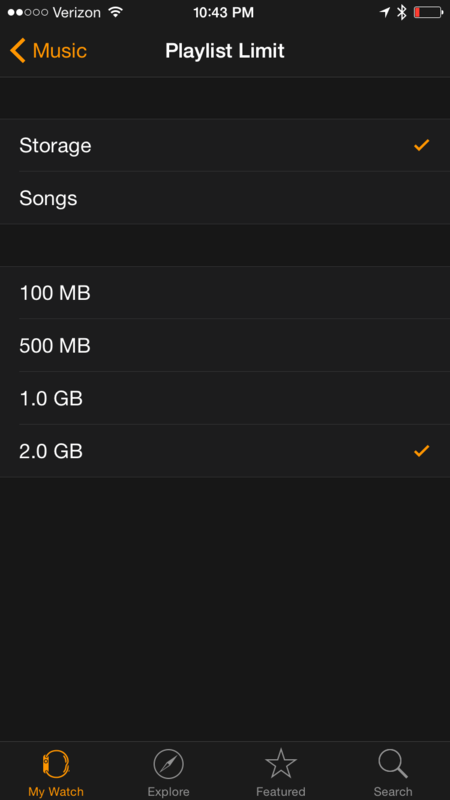 You can select 25, 100, 250 or 500 photos, which nets 5MB, 15MB, 40MB and 75MB respectively. Then tap Then wait. The photos will be sync’d to your Watch. 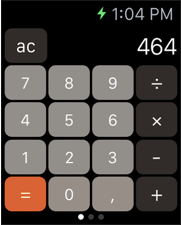 Now that I’ve found the right calculator for me, I should point out that I still take my phone out of my pocket to use a calculator. That’s a habit thing though, not a problem with the size of the objects on the Apple Watch. 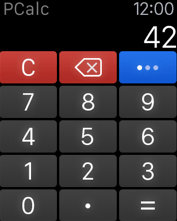 Calculator for Apple Watch Calculator for Apple Watch is a free, basic, standard little calculator app. 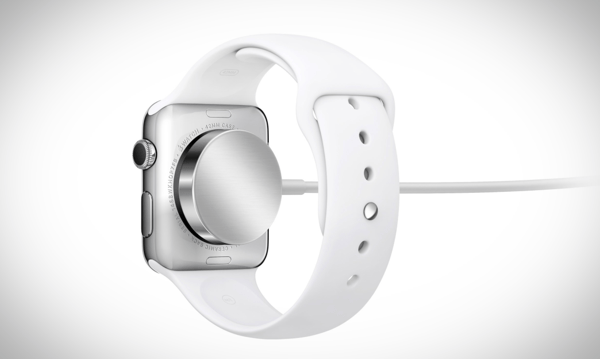 It’s the app that could be built into the Apple Watch. Calcbot Calcbot is a slight step up from Calculator. Here, we gain the ability to convert some basic things as well, such as kilograms to pounds, Fahrenheit to Celsius and a few other little things. There’s also a little tip calculator for those who need it. 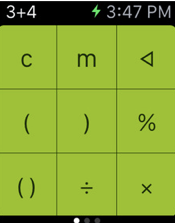 Calculator+ If you need more functions, you can also do some scientific functions, fractions, percents, etc with this one. Oh, and Calculator+ supporting using handwriting! 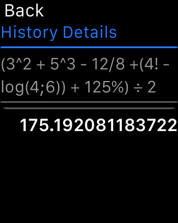 PCalc Similar to Calculator+ but adds constants and conversions. See the ellipse. That opens up a lot of different options. And you have a glance to see recent calculations from the iOS app, which can be cool if you’re in a meeting! CALC Scientific calculator (the only one where the numbers are separate on the screen). Also has history and the options available in PCalc, but adds speakable items! 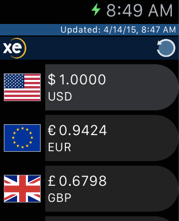 XE Currency Simple currency converter. A few of the more traditional calculator apps have some currencies, but XE has all the world currencies. Calculator Free As with a few of the calculator apps, this one has themes, so you can match it up with your band. But it also has a tip calculator, basic conversions and some of the bigger buttons (’cause lets face it, it’s a small screen). 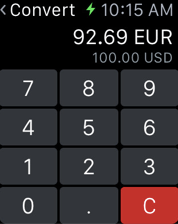 Calculator Pro All the calculator things, matched to your watch band – but you have to buy it. 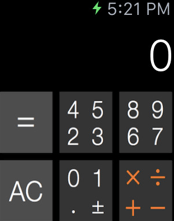 Cruncher – Watch Calculator Very basic calculator but with big buttons. Buttons are big because there are multiple objects within them. If you need bigger buttons give this one a shot. Inflation Calculator Another specialty calculator. 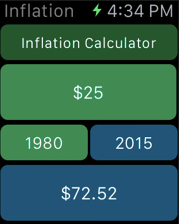 How much is $20 from 1980 worth today? Bonus: There are tons of calorie counters out there for both Apple Watch and iPhone. 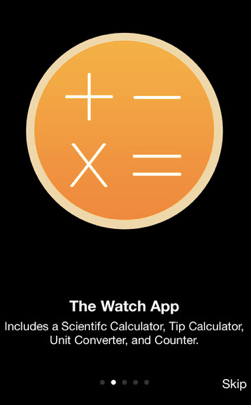 Bonus 2: There are tons of tip calculators out there for the Apple Watch, but I didn’t include any of those here. The Apple Watch will display notifications for any app that can push notifications to the watch. 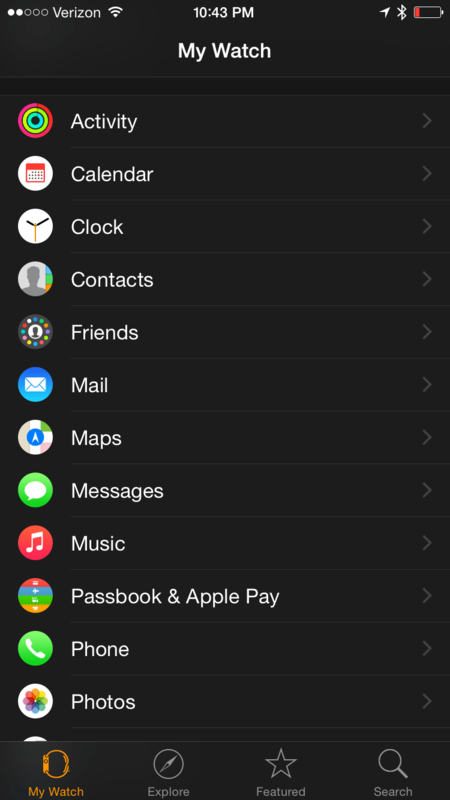 You can configure which can, by opening the Apple Watch app on your phone and tapping on the Notifications section. 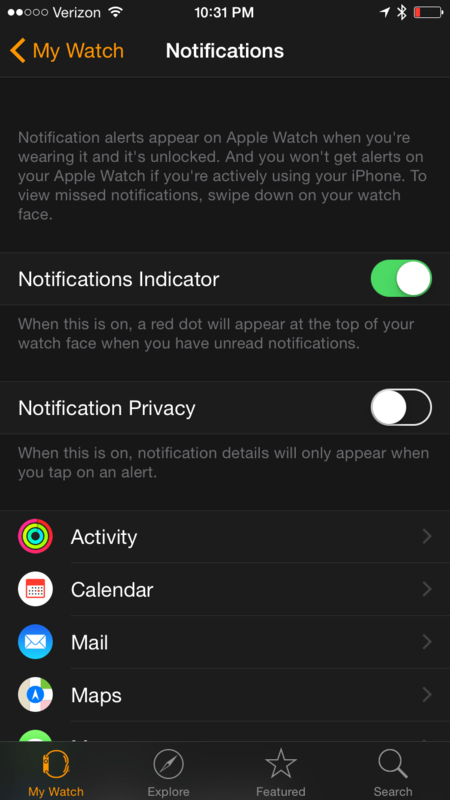 From here, you’ll be able to disable Notifications on the watch and control each app. The app with the most options is Activity. This is where you can disable stand reminders, progress updates, indications that the goals are complete, summaries and of course achievement notifications. Most of the other built-in apps can mirror an iPhone or be disabled. You can also manually control the built-in apps, which by default mirror alerts from your iPhone. The Notifications Indicator option in that Apple Watch app will disable the whole red dot at the top of the screen thingy. I don’t recommend that. If you get a lot of notifications, the better thing to know is how to disable all the notifications at once. To do so, Force Touch to invoke the Clear All screen. Tap it and all those notifications get cleared at once. Now, hopefully you can find all the things you didn’t see.